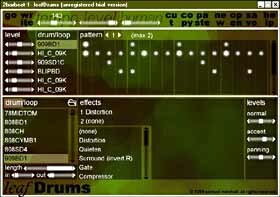 Leaf Drums uses standard WAV files for drum samples, so you can easily add your own or download more from the internet. this makes the uses of Leaf Drums limitless for creating drum loops, as you can add different drum kit sounds for the different styles of loop you are creating. It also supports loops that are re-sampled to fill the entire bar, whatever the tempo. It provides control over the length, attack, and decay of drum sounds. The effects given let you edit the delay, distortion, phaser, etc… Also, the loops can be exported as .WAV files for easy use in other application.